On the twelfth day of this month [July], we commemorate our Venerable Father Paisios the New the Athonite, who was perfected in peace in the year one thousand nine hundred and ninety-four (1994). You were shown to be full of fruit, most-venerable one. Venerable Paisios (Enzepidis), the much-wondrous and much-famed, was born in Farasa of Cappadocia on the 25th of July in 1924 from Christian parents, taking the name Arsenios after the venerable Arsenios of Cappadocia. Later he came with his parents to Greece, settling in Konitsa of Epirus, distinguishing himself as a child for his reverence and faith towards God. 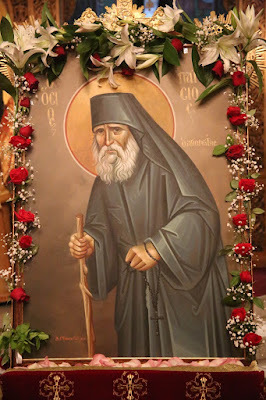 When he became a man he went to Athos and became a Monk, receiving the name Averkios at the prayer for the cassock-wearing, then during the prayer for the small schema he received the name Paisios. To occupy himself more with asceticism he went to Sinai. He settled in the Cell of Panagouda in Karyes of Athos, and many signs in his life were done through him. Furthermore, through his teachings he brought many to the correct path. He also became the spiritual guide of the Sacred Monastery of Saint John the Theologian in Souroti. Towards the end of his life he became seriously ill, and having been perfected he was buried in the aforementioned Monastery on the 12th of July 1994. He has done many signs even after his venerable repose. Through his holy intercessions, Christ God, have mercy and save us. Amen. 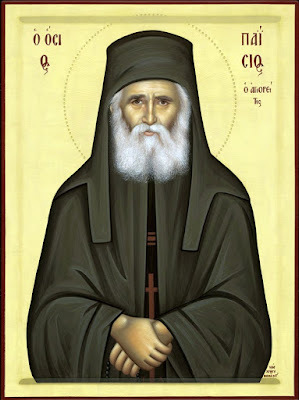 The offspring of Farasa, and the adornment of Athos, and the imitator and equal in honor of the venerable ones from ages past; let us honor Paisios O faithful, the vessel full of graces, who hastens speedily to the pious faithful who cry out: Glory to Him Who gave you strength, Glory to Him Who crowned you, Glory to Him Who grants through you healings for all. The most-famed ascetic of the Holy Mountain, and the newly-shining luminary of the Church, let us praise him with hymns with all our heart, for he leads the faithful towards a life of excellence, filling them with rivers of gifts, therefore we cry out: Rejoice, Father Paisios. Rejoice, the communicant with the Venerables, the pride of Athos, the adornment of monastics. Rejoice the new teacher of the Church, godly-minded Paisios, our boast.